Holoturian, Ariel Guzik. Underwater test, 2017. Arts Catalyst recently published this small publication to mark the planned launch of Ariel Guzik’s Holoturian in the Gulf of California in 2017 , following extensive underwater tests in a water tank. 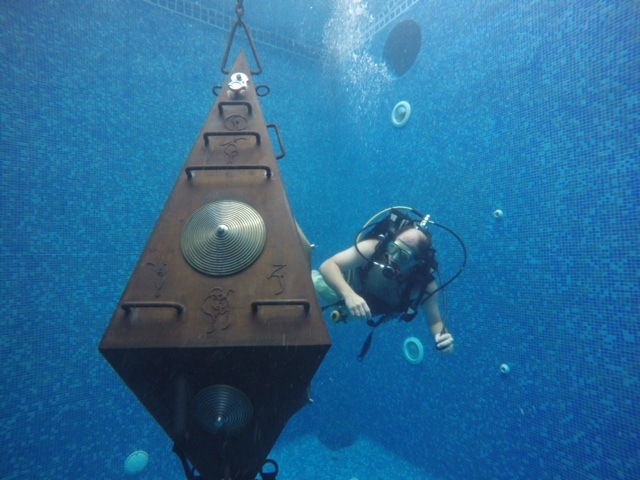 In 2015, Arts Catalyst commissioned Guzik to create his Holoturian, an underwater resonance instrument designed to communicate with whales and dolphins in the deep seas. Holoturian was shown as an installation at Edinburgh Art Festival, commissioned by the festival and Arts Catalyst. It incorporated the instrument, which filled the evocative venue with resonant sound, together with objects, drawings and films from the artist’s decade-long research project, which included a field trip by the artist and his team with Arts Catalyst to the Moray Firth in the North of Scotland to encounter the population of bottlenose dolphins that live there. The book comprises images of the research and installation with texts by me, in which I discuss Guzik’s research to date and examine what recent research has to say about whether cetaceans can be said to use language or have culture, and by marine scientist and conservationist Mark Simmonds OBE on the challenges facing these intelligent creatures in our threatened sound-filled oceans today. The book is available as an eBook ( downloadable on .pdf or on Issuu) and as a print book by print-on-demand (£6).